July 15, 2016 – It’s History in Five Friday, presented by Simon & Schuster. Check them out at Facebook.com/HistoryInFive. 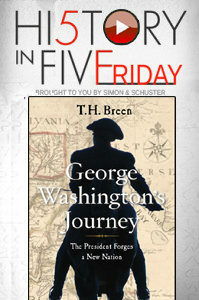 Today, author Timothy H. Breen hits the road to trace the route of our first president. His book is George Washington’s Journey: The President Forges a New Nation . Aware of the fragile and fractured nature of the new republic after independence, Washington resolves — in a day without maps or roads worthy of the name — to take the federal government to the people. And he stays not in the finest homes, but simple inns. You can enjoy the interview on George Washington’s Journey whenever you enjoy our show, or stream it at HistoryAuthor.com. Mr. Breen can be found on Twitter @TimothyHBreen.